The flat-Earthers often clog my notification feed on Twitter, occasionally endorsed by a minor celebrity hoping for some headlines and accusing us of not taking their evidence that the Earth is flat seriously enough. After all, how could you doubt someone that thinks they can check the curvature of the Earth by using a spirit level or by launching themselves in a homemade rocket? If they do wish to be taken seriously, maybe flat-Earthers should stop suggesting such stupid proofs as evidence for their baseless arguments. Here’s a short collection of some of the inane ideas that flat-Earthers have tried to use to prove the Earth is flat. 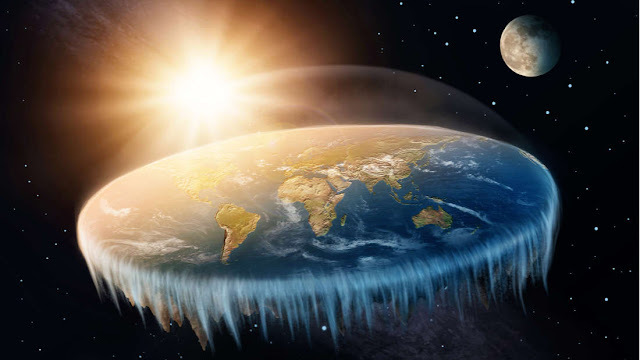 The Flat Earth Society claims that "The evidence for a flat Earth is derived from many different facets of science and philosophy. The simplest is by relying on one's own senses to discern the true nature of the world around us... This is using what's called an empirical approach, or an approach that relies on information from your senses." Sounds like a very reasonable approach. Too bad they've missed the gigantic deal that our senses are rather unreliable and humans are intrinsically biased. Science has been battling with this since its creation, you cannot use the empirical method without realizing its limitations. If you accept the empirical method, then get off the Internet. If you only believe what you can see or hear or touch, how can you be using Wi-Fi that relies on invisible (to humans) radio waves? And what about germ theory? Or magnetic fields? Oh, the flat-Earthers are still here? It appears that they only care about sensory evidence when it suits their goals. If we were actually on a flat Earth, things would look very different. Disproving flat-Earthers' ideas just requires us to demonstrate the limitations of our own senses, and, perhaps, the limitations of their intellects. The “if you look around you can see that the Earth is flat” argument falls into the latter category. The Earth appears flat because we are tiny and it is huge. But if you want to see for yourself that Earth isn't flat, just climb a hill, head to the top of a skyscraper, or go on a hot air balloon ride. Actually, the latter would be the most effective. You will literally see the horizon expand. Sometimes you really can’t make this sh*t up. One of the main "proofs" that the Earth is flat is that the bottoms of the clouds are too. Again, let’s use our senses. Yes, some clouds have flat bottoms. But others don’t. And this doesn’t depend on the curvature of the Earth. The flat bottom of cumulus clouds is created by changes in pressure and temperature in the atmosphere. Water vapor can only condense below a certain temperature and, especially on warm days, can travel upwards by thousands of meters. As it travels, the air expands due to the larger volume (how does that work on a flat Earth?) and the pressure drops. Pressure, volume, and temperature are all connected. So there will be a very specific height where the vapor starts condensing and the bottom of the cumulus cloud forms. We can easily prove that the Earth moves and that other planets cannot possibly be orbiting it. But apparently, all the mathematical and observational evidence is not good enough for the flat-Earthers. They claim you can see the Sun move. And since our senses cannot be fooled, the flat-Earthers are also claiming that the image below is a gif with moving circles rather than a JPG. I hope for their sakes they're never on a train when the one next to them begins to move. That would blow their minds. So my question is: are you actually serious flat-Earthers? You tell us not to believe NASA and all the other space agencies, claiming they spend trillions of dollars every year to keep the millions of people who work in the space programs quiet. Yet we should blindly accept the word of dead Englishman with an agenda?!!!! Sometimes, I do wish that flat-Earthers would begin to use their senses. And common sense would be a good place to start.